Serving animals and people by engaging the hearts, hands and minds of the community. To compassionately and responsibly create a more humane world for animals. Nothing says "Be Mine" like a puppy! The Martinsville Henry County SPCA will be making Puppy Gram deliveries from 9am - 4pm to your sweet on Valentine's Day for a $40 donation. The special someone will get a cuddle-session by a furry friend, and card from you letting them know that your gift to our shelter was made in their honor. If you are interested, please call 276-638-7297 to reserve your Valentine's gift. 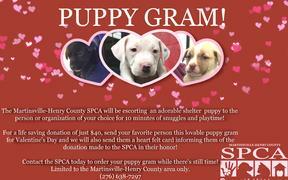 We are also actively seeking volunteers to assist in puppy deliveries! If you are available that Thursday, February 14th and you have your own transportation, please give us a call!